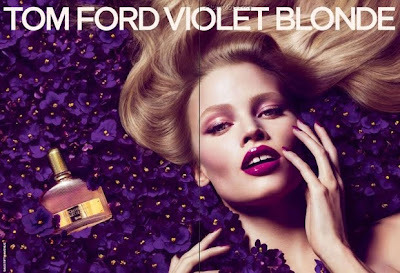 New Tom Fords fragrances are going to launch officially very soon: Jasmin Rouge, Violet Blonde, and Santal Blush. After a successful course and some discontinuations (such as the compelling Velvet Gardenia), Tom Ford continues to expand his line, this time in a curious mix of Anglo and Franco languages in their names; perhaps in the case of Violet Blonde the implied wordplay is it might look like "violent blonde" to the casual onlooker, thus instigating a second, closer look. Given the steamy ads for Neroli Portofino, a best-seller in the line with matching body products, the anticipation for the new images is palpable. But let's see how the new fragrances smell and take a look at their respective bottles. Violet Blonde is a complex scent with a nuanced character, woody and vanilla/benzoin laced, without too much sweet violet notes, but rather the powdery, soft scent of iris. The bottle designof Violet Blonde is the same as Tom Ford White Patchouli in the transparent glass used for Tom Ford for Men bottles. 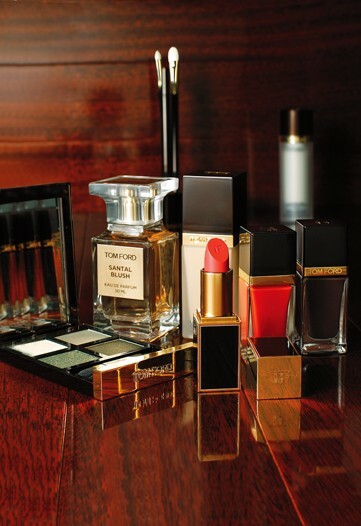 The square Tom Ford gold name-plate is given a twist into a rectangular gold name-plate that stretches across the bottom front of the bottle (as seen in the photo of the ad below) and in each corner of the plate a small gold bolt is added. Violet Blonde is available in 30ml and 50ml of Eau de Parfum and is part of the regular Tom Fod line (alongside Black Orchid and White Patchouli), available at major department stores. 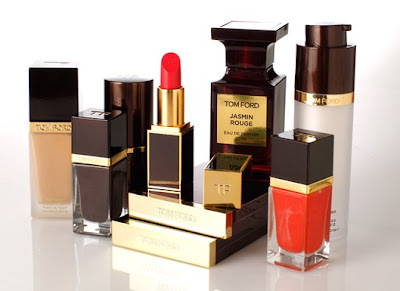 Santal Blush and Jasmin Rouge on the other hand belong to the Private Blend line by Tom Ford with the hefty price-tags. Tom Ford Santal Blush is a gorgeous, clean, dry sandalwood with an immediate message of sensuousness and no boozy aftertaste, beautiful and wearable, composed by talented perfumer Yann Vasnier. The bet wasn't an easy one: Composing a sandalwood fragrance evocative of the Indian splendors of the Mysore variety known from the past without actually using the raw material due to its regional restrictions on use. 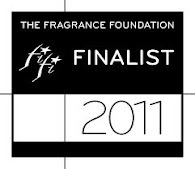 The result more than compensates, entering into sandalwood fragrances top list, always popular with perfume lovers. If you like Tam Dao, this is a refined take on that scented memory. 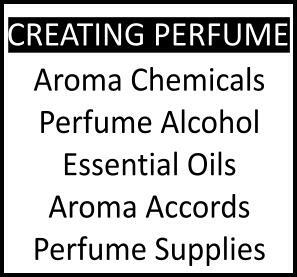 "Masala spices from India, Cinnamon Bark Oil Sri Lanka ORPUR, Cumin Seed Oil, Fenugrec Absolute and Carrot Seed Oil, are enriched by a floral blend of Jasmine Absolute, Rose Absolute and Ylang Madagascar. An infusion of richly textured Sandalwood captives, Australian Sandalwood, Benzoin, Agarbois and Skin Musks, transport the scent of Santal Blush to another level". 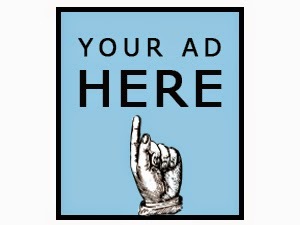 It's highly recommended and I predict it will be supremely popular among the cognoscenti! Tom Ford Jasmin Rouge is perhaps the weakest link, since it has a sweet character that can turn a bit plastic on some skins. Of all the jasmines I have recently tried it's the one that impressed me least because I had the highest expectations from. Still a new jasmin from a niche line always sends a kind of frisson down some spines! Violet Blonde, Jasmin Rouge, and Santal Blush by Tom Ford are now available for testing at Saks New York and Bergdorf Goodman in NYC, though latter store mentions a September launch date for the US and a later date in October for the international market.The launch will coincide with the new make-up range and a new male grooming products launch. Tom Ford: Coining perfume names to confuse sales associates since 2005. I can't wait to try Violet Blonde and Santal Blush. They both sounds like they'll be winners. When I saw the cosmetics, I wondered why YSL beauty thingies are mixed with Tom Ford perfumes. Interesting. Since Tom Ford fragrances are not available at this back of the woods, I'm doomed. Love the bottle. And it sounds like it smells good too. it is lovely if only people don't mispronounce it Violent Blonde. Then again, that sounds rather interesting too, doesn't it? It gives me visions of 50s gigantic mutant women from pulp fiction books and films. I think whatever Tom Ford does has a bit of the Midas touch. It's sort of discontenting, coming from someone with that bit of sleaze like himself. But we have to give it to him; he knows what he's doing perfectly well. The cosmetics are quite good. The frags are usually good too, if sometimes overpriced. Like I said above he has some sort of Midas touch. Alas! if you meant the Violet Blonde bottle, yes, that shape is old-fashioned and yet modern too at the same time. Odd but it works!